Clark maintains a network of indoor and outdoor emergency telephones (e-boxes). The emergency telephones have been placed in areas where members of the University community could find themselves isolated or without method of communication, and thus more vulnerable. 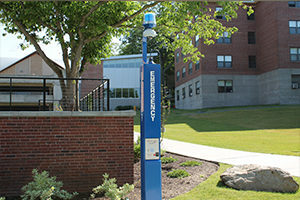 To use the outdoor phone, students, faculty and staff should push the emergency button on the blue pole or inside the yellow box (open the steel door first) to create an automatic connection to University Police that cannot be disconnected. University Police automatically know which box has been used. A microphone in the box allows University Police to hear anyone using the phone. Indoor emergency phones are red and are located throughout campus buildings and in all elevators. To use the indoor phone, students, faculty and staff should simply pick up the receiver, and the call will immediately ring in to University Police on an emergency line. The University Police Department is constantly evaluating the effectiveness of the emergency telephone system and identifying possible sites for additional phones.